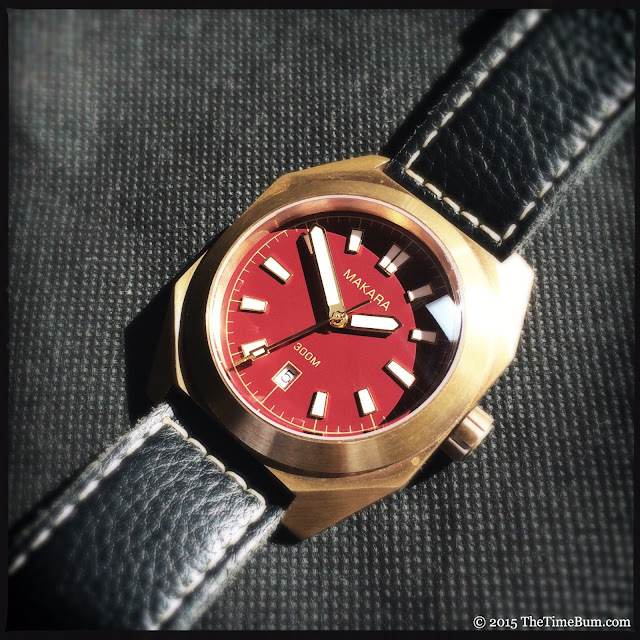 Canadian micro brand Makara has a thing for dive watches and octagons, and hey, why the hell not? Divers are cool tools, the watch buying community seems to have an insatiable appetite for them, and there is no shortage of round or cushion case divers out there. Makara introduced their signature shape with the aptly named Octopus in 2014 and followed up with the Sea Turtle series in 2015. The line is comprised of two models, rated for 300 meters, and available in black, teal, or maroon. The standard watch has round, printed markers and arrow-shaped hands while the Hawksbill has pencil hands and applied geometric markers. All other attributes are the same. 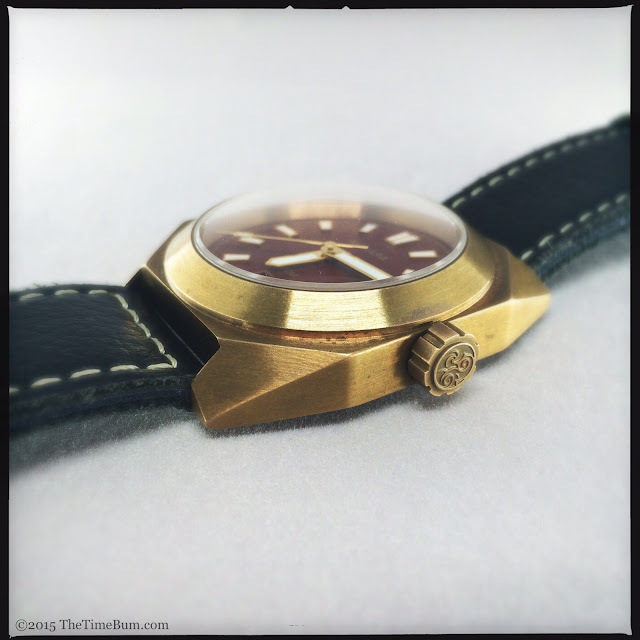 For this review, I borrowed a Maroon dial Hawksbill model from a happy owner and gave it some quality wrist time. 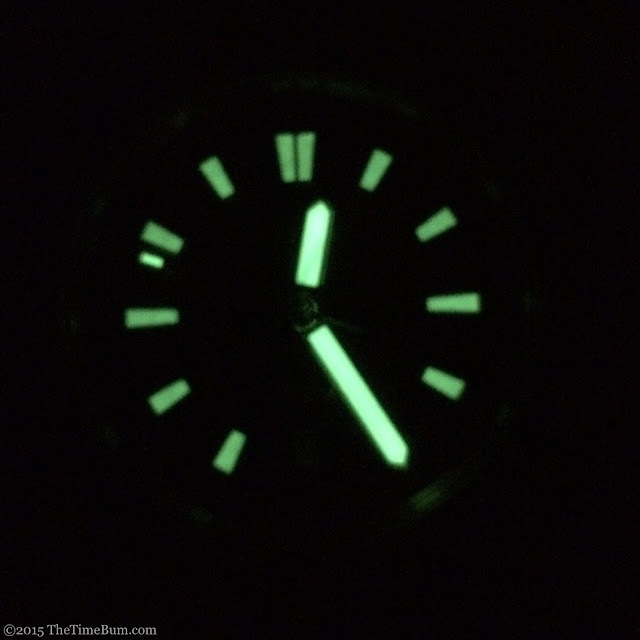 The Sea Turtle's heart is a Seiko NH35a. This 24 jewel automating hums along at 21.6k bph. It hacks, hand winds, and has a power reserve of over 40 hours. This is a well-regarded unit, known for durability and reliability if not sexiness. Because it is a derivative of the old 7s26/36 series, servicing should be a breeze for any competent watchmaker. By just about any measure, this is a big watch. 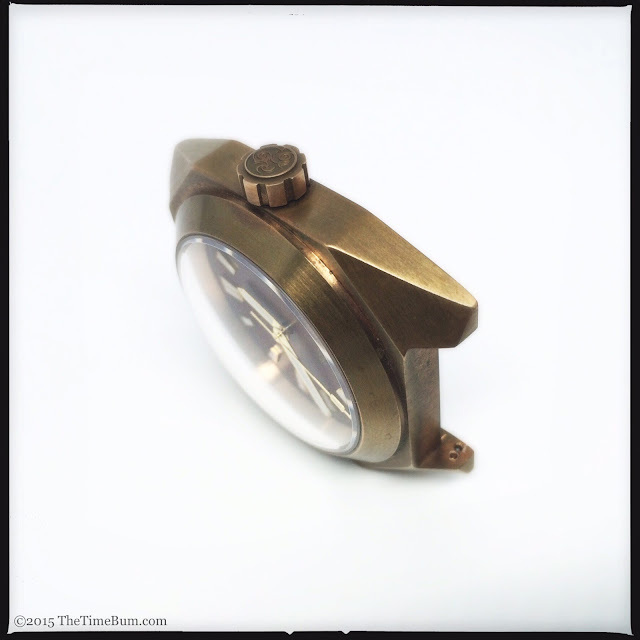 The CuSn8 bronze case is 44mm wide, 52mm long, and 13.5mm thick, but this is only half the story. These would be prodigious dimensions for a round case, but the Makara has more in play, driven by three key design elements. First of all, the case has broad, flat sides, longer than its chunky, angular lugs. As a result, the corners of watch stretch much farther outward than those of a symmetrical shape. The faceted lugs meet at the second element, a smooth, round bezel, and frame it in a perfect octagon. That bezel rises upwards and inwards to meet the third element, a massive, double-domed sapphire crystal towering over the case, raising the overall thickness to a whopping 17mm. It is an imposing brute of a case, and one that should look even more imposing as the metal develops its characteristic mottled brown patina. An 8x3.5mm bronze crown juts out at 3 o'clock. The fat wheel looks a bit lonely standing alone against the flat expanse of the case. In a way, it makes sense given the slabby shape, but I wish it had some crown guards to provide a transition. That said, in every other respect the crown is magnificent. It is easy to grip and screws in smoothly. A stainless steel crown tube prevents contact between the crown and the case, eliminating the risk of oxidation fusing the two parts. Best if all, it is a damn beautiful knob, cast with a heavy dental edge and a detailed spiral decoration. 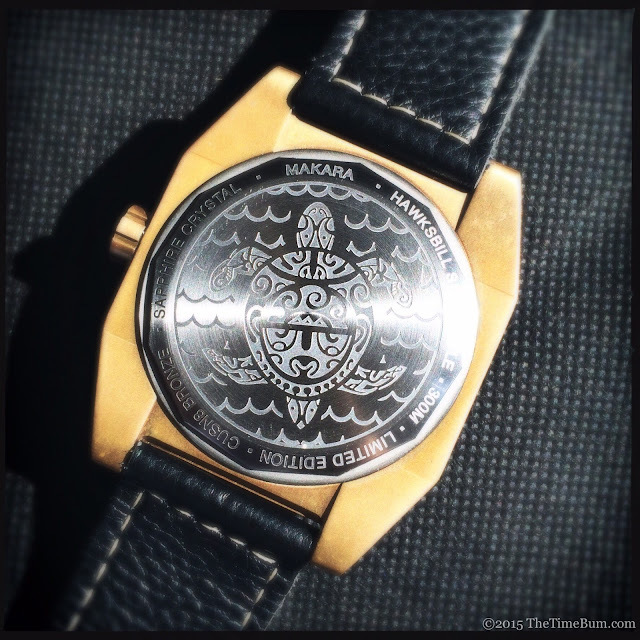 The stainless steel case back has an engraved illustration of a turtle surrounded by waves. Like the crown decoration, it has a distinctly Polynesian look and is nicely rendered. Things like decorated case backs and crowns cannot carry a watch design in and of themselves, but can go far to enhance it and provide an extra measure of satisfaction for the owner. The Sea Turtle's decoration decisively achieves these aims. 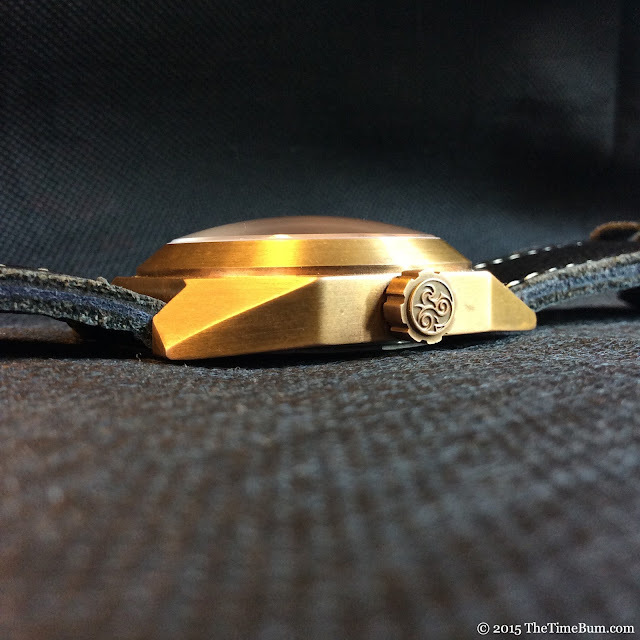 With so much attention lavished on the crown and case back, the dial is comparatively plain. The gold, four-cornered, angled markers are applied, polished, and large enough to hold their own on this expansive piece. The hands too are properly sized, and brush their respective markers as does the paddle-tipped second hand. The index is printed in gold as is the text and frame around the 6 o'clock date window. All hands and markers are treated with white C1 SuperLuminova, although the hands glow far brighter than the markers. 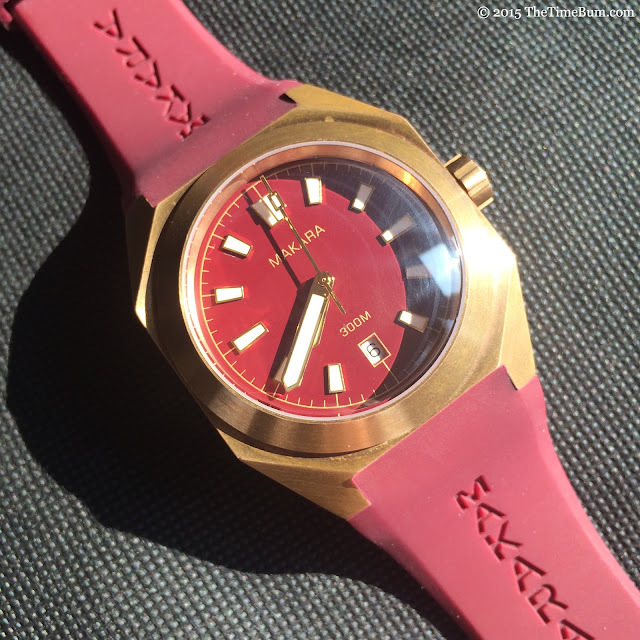 The color is a very nice burgundy that goes dark red in sunlight, but the finish is flat, and there is no texture or light catching effect on the dial to draw you in. Dial text is limited to the brand name and water resistance rating, and while I appreciate the lack of clutter, I found myself longing for some decoration. The font is just a generic sans-serif, looking exactly like any number of other micro brands. Using a more creative typeface and incorporating the crown or case back illustrations as a logo could have worked wonders but as it is, the dial is perfectly nice, represents a lost opportunity to excel. 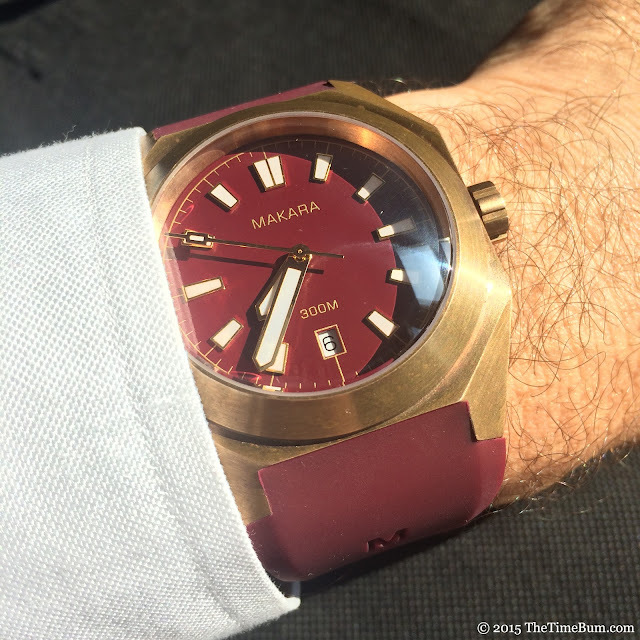 Makara has put together a rather nice package for this watch. 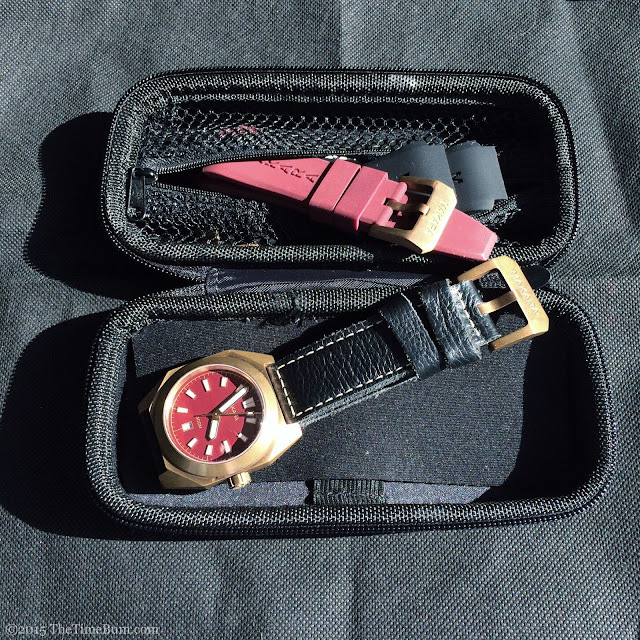 It arrives in a handy neoprene case with room for a watch or two (safely separated by a flap), and a couple of extra straps in a zippered mesh compartment. I was even able to toss a strap changing tool in there without any fuss. 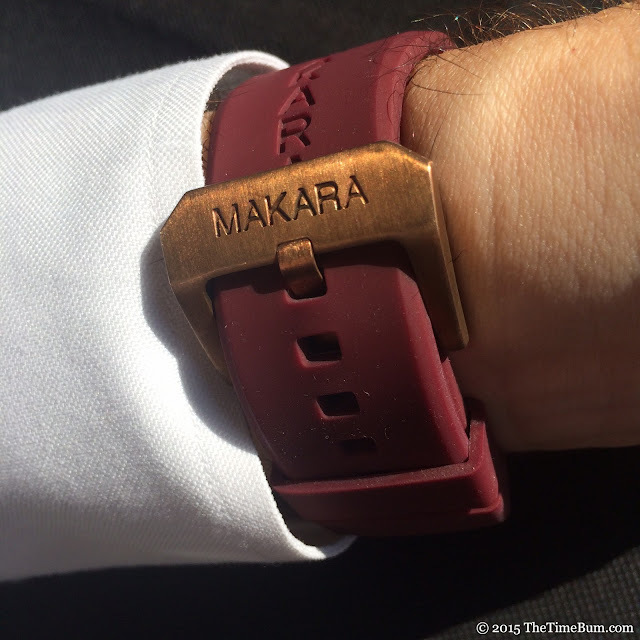 It comes with two 24mm straps, one maroon rubber, and one black leather, both with heavy bronze buckles engraved with the Makara name. In an interesting twist, there are two sets of spring bar seats inside the lugs. I've encountered this feature on other watches, and I like being able to adjust for different straps, but the Makara's are very close to each other, which makes it a bit too easy to hit the wrong perch. The flat rubber appears to be soft silicone and is quite comfortable. Fitted ends sit snugly against the case and flare outward to cover the ends of the lugs, meeting their outer edges and matching their angle as the strap tapers back to 24mm. The Makara name in molded into both lengths of the strap, which is overkill given the bold branding on the buckle. The leather strap is thick and pliable with a pebbled grain and white stitching. It is perfectly serviceable, but not terribly impressive. The raw cut sizes expose an unattractive layer of filler under the thin veneer of top leather, and I do not think black is the most flattering color for this dial. Still, I ended up wearing the watch on the leather strap for almost the entire time I had it, albeit for reasons that had nothing to do with its appearance. You see, I discovered that I am actually allergic to that bronze alloy. I have been allergic to nickel my whole life, and most forms of gold plating will eat my skin, so discovering a reaction to another metal was hardly a shock, but I have not encountered this problem with any other brass or bronze watch. I realized the difference here was that the flat rubber strap allowed the bronze buckle to remain in direct contact with my wrist while the thick leather strap kept the buckle elevated and away from my skin. The stainless case back did the same for the bronze case, minimizing contact. I discovered this was true of my other bronze watches as well. Go figure. I am quite sure I am in the minority on this one, but it is something to consider if you are prone to metal allergies. Dermatological considerations aside, the watch fit me rather well as the lug-to-lug was short enough to wear without any overhang. It is by no means modest – this is a big, bold sport watch after all – but it is wearable and a heck of a lot of fun. The Sea Turtle sells for $395 direct from MakaraWatches.com. This is a nice price for a 300 meter diver, particularly in bronze. You would normally expect brass at this price. Throw in a quality automatic movement, unique case, and that gloriously crazy dome, I'd say you are getting a good deal for your money. Pro: Mighty dome, lovely crown. Con: Conservative face. Poor leather strap. 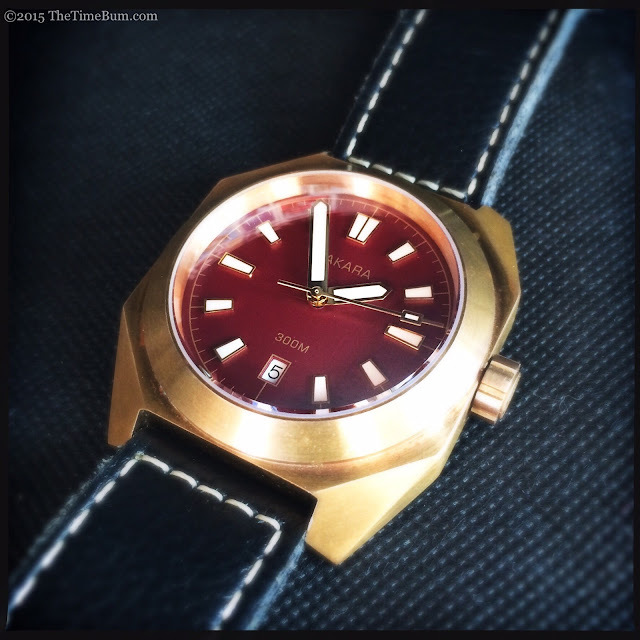 Sum: A solid value for a bronze diver. The Time Bum approves.